See more objects with the tag urns, girls, education, mourning, tombs, weeping willow, mourner. See more objects with the color tan darkkhaki dimgrey beige darkolivegreen or see all the colors for this object. This is a Mourning sampler. It is dated ca. 1810 and we acquired it in 1974. Its medium is silk embroidery on silk foundation and its technique is embroidered and painted on plain weave. It is a part of the Textiles department. 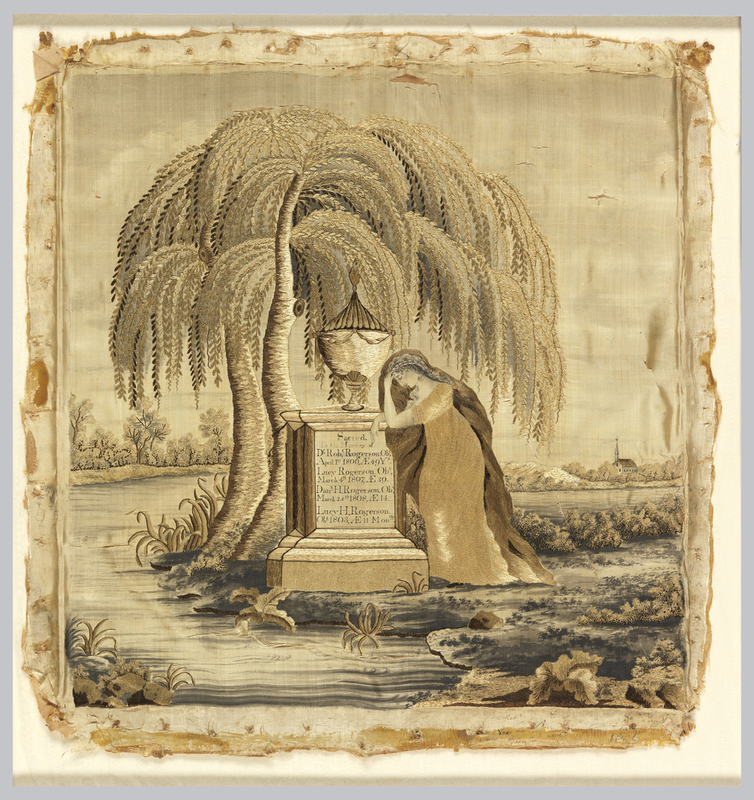 To a modern eye, mourning samplers sometimes seem insufficiently personal or idiosyncratic to represent genuine grief, relying as they do on stock motifs—the woman in classical dress leaning in a posture of grief against the tomb, under a weeping willow. In fact, mourning was perhaps more fashionable than emotional; following the death of George Washington in 1799, memorial pictures were produced in many media, and the fad of memorializing family members using the same iconography soon followed. But the predictability of the imagery cannot mask the losses many children experienced. This sampler was presumably embroidered by a girl in her early teens who had lost two siblings and both of her parents in quick succession. This object was donated by Unknown. 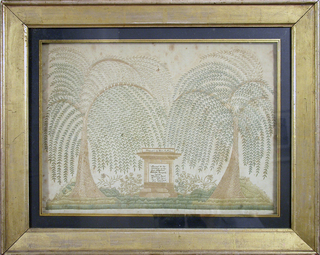 It is credited Gift of Anonymous Donor from the Fraser/Martin Collection. wool and cotton embroidery on wool foundation. Gift of Myra M. and William H. Mathers. 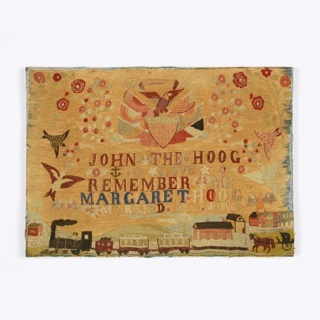 This object was previously on display as a part of the exhibition	Maira Kalman Selects.